In case you haven't heard, TXLA was this past week. Sadly, I could not go all 4 days, but Cynthia from A Blog About Nothing and I did make it there for one day. And boy are we glad we did. Not only did we snag some awesome goodies, we also met some amazing authors (Carrie Ryan, James Dashner, Gayle Forman, David Leviathan, and many more). BUUUT, the very best part was hanging out with fellow Literary Lonestars and Blogger Buddies. I've got pictures and will be posting about the event very soon. Till then, let's get this IMM started! And that's it! Feel free to leave links to your IMMs below! It was so great to meet you and chat with you at TLA! Wow you got a ton of awesome books! I haven't even heard of several of them, so I will have to check them out. Enjoy your books! @Katie- It was great meeting you! I hope we get to hang out again soon! @Annabell- I haven't heard of some of them, too, but the look good, hahaha. Oh Lena!! this IMM post is full of awesome :-) I wish I could have been there with you girlies. 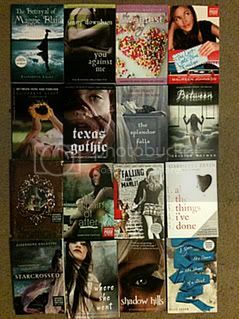 I am jealous of SO many of these books!!! Especially The Beginning of After, Between Here & Forever, Back When You Were Easier to Lover, & of course your signed book by Gayle Forman!! Totally awesome! Great haul! :D I hope you enjoy them all! Great IMM. Hmm, the people on the cover of Reaching Through Time by Lurlene McDaniel are the same as Return to Paradise by Simone Elkeles. That has been happening a lot lately. 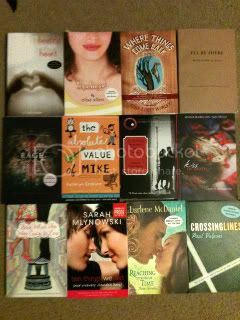 I got a lot of those books at the TLA conference too! Great IMM! SO glad you got to come! I wish I could have hung out more. My TLA post will go up tomorrow. YAY TLA! I wish I had been in the car with you and Cynthia I bet it was a fun road trip! @Jen- You were a busy girl that day! I wish we could've stayed an extra day, so we all could've hung out at night. Boosauce. Maybe next year! The Beginning of After? Ahh... shocked :O Me want it!